Join CSSP as we once again will march in the Denver Pridefest Parade! Additional details coming soon! 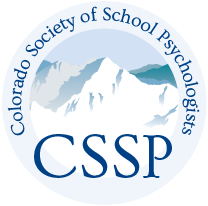 The Colorado Society of School Psychologists and the Colorado Department of Education have partnered to bring this training to school psychologists and educators! This workshop will cover signs of internalizing problems such as anxiety and depression that often go undetected, yet impact our students at a relatively high rate of occurrence. Advocating for our students includes understanding the complex signs and symptoms, as well as assessment and intervention practices that are efficient, effective, and useful within an ecological and multi-tiered systems approach. This training will address current research and practices pertaining to these issues, and also review how Social and Emotional Learning (SEL) efforts and schoolwide positive behavioral supports (SWPBIS) can work in a complimentary manner to support students. We will also explore practical ways in which school psychologists can collaborate with community providers, and engage educators and families to maximize advocacy efforts. Barbara Gueldner, PhD, MSE is a licensed psychologist and Nationally Certified School Psychologist who has worked with youth, families, and community partners for 25 years. Learn more at https://successfulkidstoday.wordpress.com/. Katherine A. Ruffatto Hall Commons (Rm 106), 1st floor,1999 E Evans Ave.
Save the date for our 2019 Fall conference November 7-9, 2019.